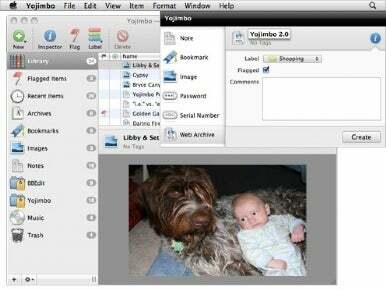 Bare Bones Software on Tuesday announced the release of Yojimbo 2.0, an upgrade to their information organizer for Mac OS X. It costs $39 for an individual license or $69 for a family pack. Upgrades from 1.x are $20. Yojimbo can be used to organize any kind of information you want. Yojimbo is a free-form information organizer. It lets you collect different data types ranging from text to passwords Web bookmarks, serial numbers, PDFs, images, Web archives and other data. Features include a built-in search engine, data encryption, copy-and-paste and drag-and-drop support, support for Mac OS X Sync Services and more. New to the 2.0 release is the new Tag Explorer system, which lets you navigate through the contents of your Yojimbo library by filtering items based on whatever tag you’ve selected. New commands have been employed for adding, removing and setting tags for a specific item. The Quick Input Panel has been changed to accept dragged images, set “date imported,” figure out titles for untitled URLs, and now lets you set more metadata for items when they’re created. A new “New Image” command has been added, the search field has been enhanced to provide completions for tag and label names, fixes to reported issues have been made, and much more. System requirements call for Mac OS X 10.5.7 or later. Yojimbo is compatible with Snow Leopard.